Over the weekend I installed a SGe on my Prius which I'm driving daily now. Darin and Ben asked me to do a review on it for the blog. I have it hooked up along with the SGII, so I have both running. I'll be sharing what I learn about it and giving feedback on the pros and cons of the SGe vs SGII. I'll get pictures up this afternoon when I get home. If you have any specific questions about the SGe or anything you'd like me to try just let me know. what are the differences between the two? only the amount of data displayed or recorded? or just the price? i need one just need to know which one is better sg2 sge or ug. if i buy from em does it support the site instead of buying from ebay. I'll be going through all the differences throughout this week or so as I learn more and use the SGe more. There is more to it than just 2 less gauges displayed on the screen. They've added features to the SGe that the SGII doesn't have and have done some work with it to make fact that it only displays 2 gauges at a time not so bad. If you buy from EM, it does support the site. I got the first batch of pictures together. The first thing that I noticed with the SGe was that it has only one port to connect the OBDII cable to. This port is on the back side of the gauge. This is an image of the back side of a SGII. You can see it has a plug on the back side and also on the right side of the gauge. This does allow a bit more flexibility when choosing where to mount the gauge. Next up, I got a nice compairison shot of the two gauges next to each other. While the SGe is smaller, its not a TON smaller than the SGII. I'll be using the SGe in my 04 Prius. I already have a SGII in the car an will be linking the SGe to the SGII so I can use both at the same time. This is done by using the 2nd port on the SGII and using a ethernet cable to connect up to the SGE. Super nerd instrumentation! So, this is how I have the gauges setup in the car currently. Despite the dark look of the SGII (which I've customized the display color and brightness), its still quite easy to see. The SGe in these pictures is just set to the default color/brightness. Its actually a little annoying bright when its dark out. I recommend changing it. On the SGe, what's the black box on the left of the line that shows your ignition timing? I'm guessing it's a graphical display? Yes, that's a bar graph. I'm not sure if it changes when you switch gauges. Sitting still means "0 mpg" so it's pegged at the bottom. Here's what it looks like with P&G. Ah - I assumed it was a graphical representation of the gauge currently displayed on the right side (IGN in that case). Yeah, I don't know if it changes to reflect the gauges or if it's always mpg. The graph always tracks MPG. However, the scale of the graph, or how it displays is configurable. By default, the graph's zero (halfway) shows as your trip average. Therefore you know if you're doing better or worse than your current average. This is a pretty nice setup IMO. 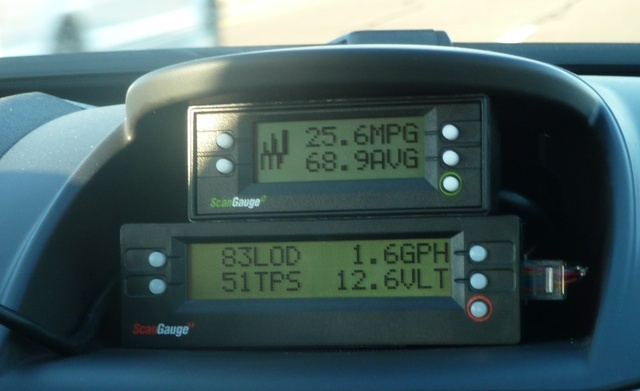 However, you can also set the graph's zero point to a set MPG. They call this "GOAL", and you can manually set whatever MPG you want as your zero point (0-255). With GOAL you can see if you are hitting the MPG you want or not. You could even set GOAL to the EPA rating of the car to see how good you're doing compared to it. Or, you could set it to your 90 day average to see if you're improving upon it.